Are You my ’Bu? 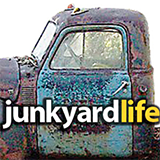 Junkyard Life and Colonnade era cars are becoming synonymous. We appreciate them more and more. This lovely 1976 Chevy Malibu Classic refuses to be forgotten. Wearing aged Cosworth Silver paint, this car represents a strange time indeed. We find it cool now, but then? No, this would not be acceptable. Don’t blame Chevrolet. Maybe you blame GM and the terrible government standards they had to meet. The bumpers? Hated them. The headlights? Hated them. They are square. 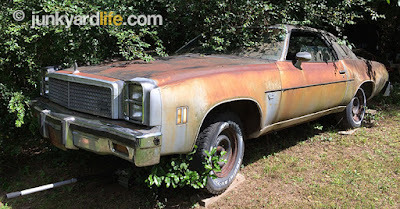 I’m not sure why GM mandated a square headlight on most intermediates in 1976. The previous year’s models already had enough design flaws against them with new car buyers — and those had appropriate, attractive, round headlights. 1976 was square. Mr. Rogers was square. “Square” was a word that would not be popular in anything other than dancing. “Hey! have you seen the new headlights on the Malibu?” Square. A/C, AM/FM stereo, and a clock – what more could a 1976 Malibu driver want? That was then. Now we declare them to be cool. (Editor’s Note: Junkyard Life staffer Ron finds them cool, but he drives a station wagon and has every Ambrosia album) This car could be dismissed as basic transportation upon first glance. Maybe even your second glance, but wait for it… it’s cool. Too late, I already declared it. We’ve reported several times previously that cars of this era gained weight (for safety) and lost power (emission regulations and stricter fuel consumption). We know that. It is not a 1970 LS6. Do you have a 1970 Chevelle SS? Neither do we, so let us rabid car guys take a look! 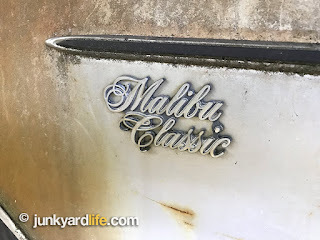 The Malibu has been parked outside for the better part of 20 years. At one point the front end was raised onto concrete blocks. First, these wheels are not Rally Wheels. That is true, but dig if you will — the picture above… hub caps on steely wheels! Not here, but imagine your favorite hub caps. Your options are vast and unlimited. Dog dish anyone? You lucky guy, not only the cool, unique-as-you-want-to-be factor, but these are 15-inch versions. GM tended to give us those in the 1970s and then took them away again. 15-inch wheels are getting harder to find. 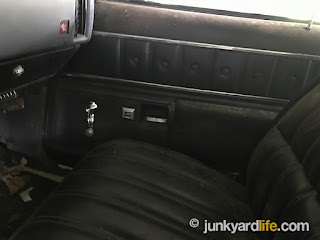 The 1976 Chevy Malibu’s bench seats were great for families and dates. 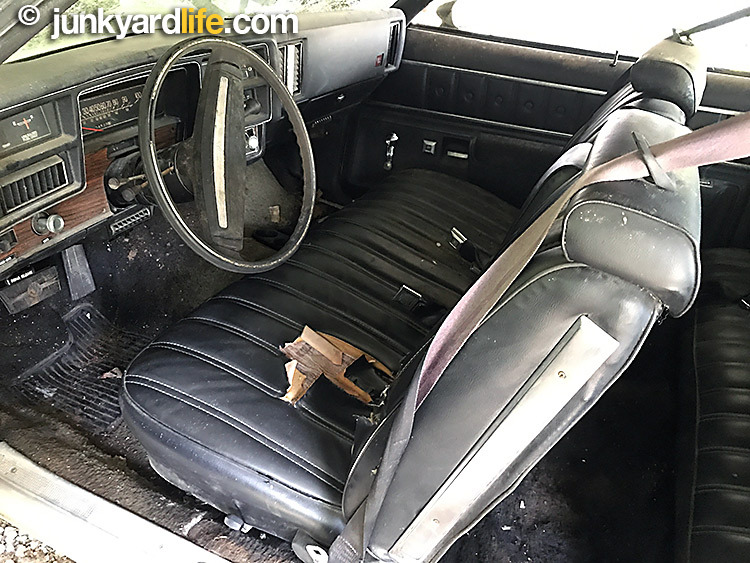 Inside we find a deluxe bench seat with a fold down arm rest. That makes for comfy driving and added room for important situations, such as a date sitting right beside you. Bucket seat owners in the 1970s didn’t have that luxury. 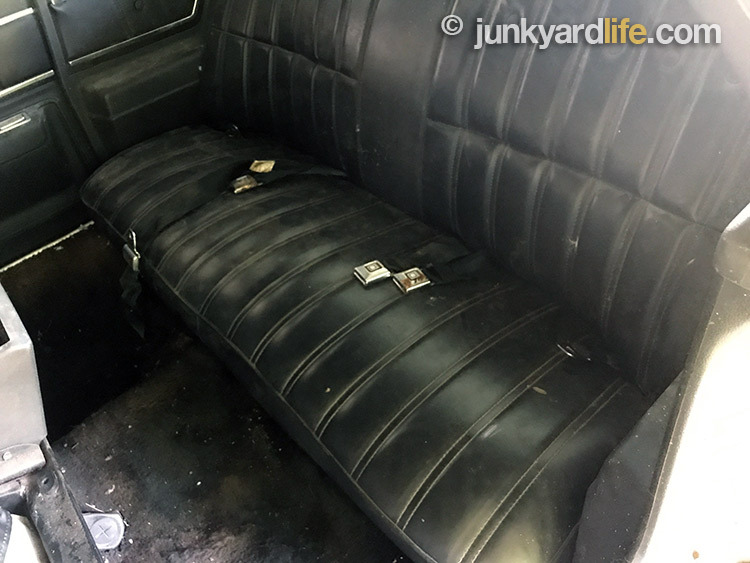 The interior was in surprisingly good shape. Even the headliner was still up and intact. Notice the silver paint under the decklid? Yes, the owner painted half the car black on the exterior. Probably to cover the surface rust, otherwise known as the sunburn showing through the silver paint. 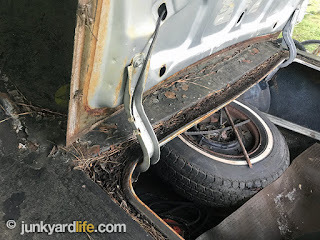 Junkyard Life has done it again! 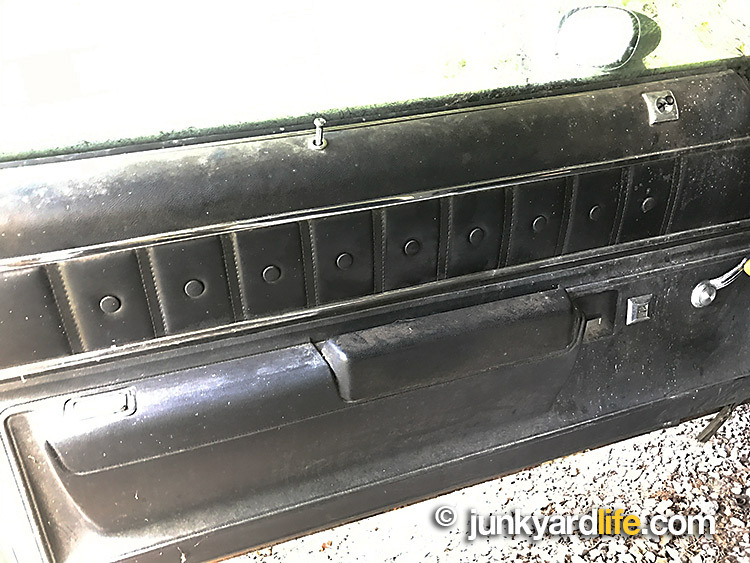 We have found a car with manual windows, yet it has power door locks. Maybe that is not as unusual as we initially surmised. Still, we find it to be another item checked off in the cool factor line. The options are really not on a short list here. 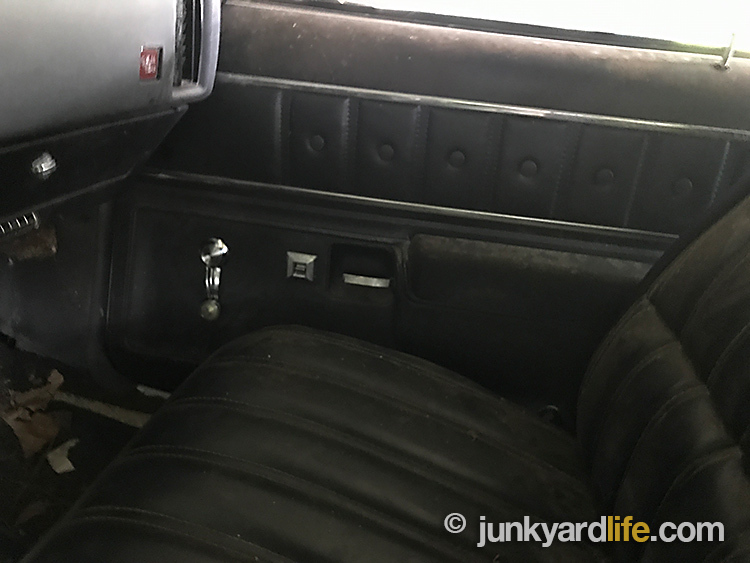 Power steering, power brakes, air conditioning, power door locks, tilt wheel, AM/FM stereo (no tape deck) fold down arm rest and the coolest option of them all… a rear window defroster! Lots of GM cars want that! 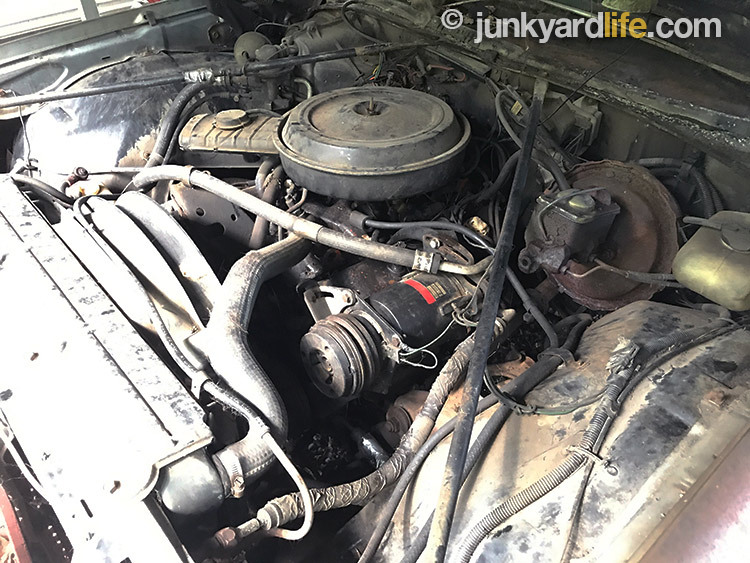 The Chevy 350-V8 engine has a 2-barrel carb and A/C. Under the hood we found a complete 350-V8. I was anticipating a 305, so that was a pleasant surprise. The engine was equipped with a 2-barrel carburetor and, I can only guess, a fuel friendly set of highway gears in the rear. It was complete and all there, it would not surprise us if it could still run. 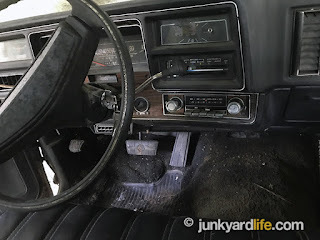 By 1976, GM was two model years into the electronic ignition success of the H.E.I. distributor. A wonderful gift to the car guy world — no more points and condenser to leave a guy stranded on the side of the road. Okay, we know it is not a 1973 SS or a Laguna S-3. We still love it. I hope we can find this overlooked classic an appreciative home (We did! To be continued soon) and also do our part to help resurrect interest in these cars. Fred Carbuyer and his car guy friends would swear that GM, Ford, Mopar, or any other car maker didn’t build anything after 1972. Their interest fell as the horsepower ratings plummeted and gas became more expensive. Malibu is a cool car named after a cool place and that has a rock-n-roll air about it, no matter what Mr. Rogers would say. 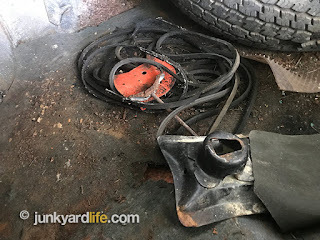 A look in the Malibu’s trunk finds an assortment of belts, a jack, and a shredded spare tire. Rear seat looks minty fresh. Not many riders sat beneath the sloped rear glass. Known for giving passengers a sunburn on their neck during summer road trips. Rear seat smokers delighted when they could tap their ashes in quiet comfort into the door-mounted ashtray without having the driver roll down the windows. 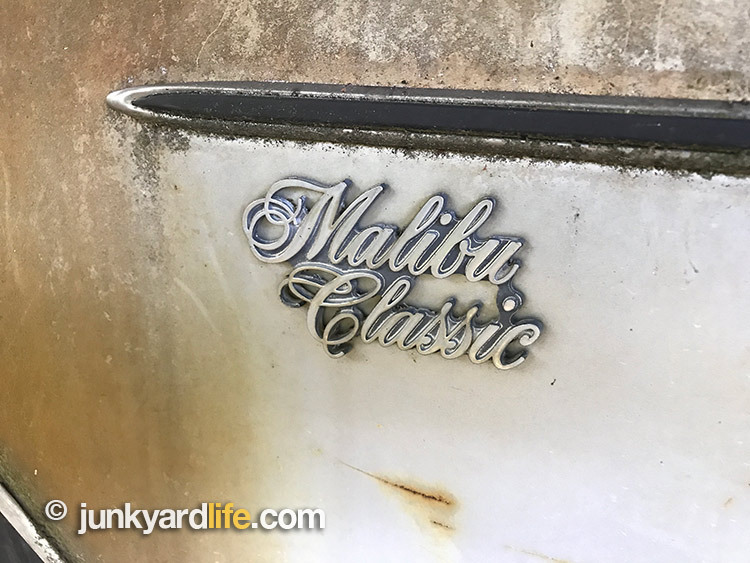 Malibu went “Classic” long before Coca-Cola did. 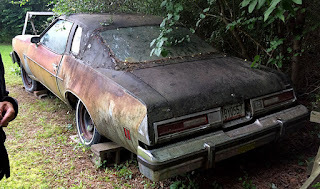 Raised by a junkyard owner during my formative years and driven by necessity to own older, well-worn vehicles on their last leg of a journey to the junkyard. 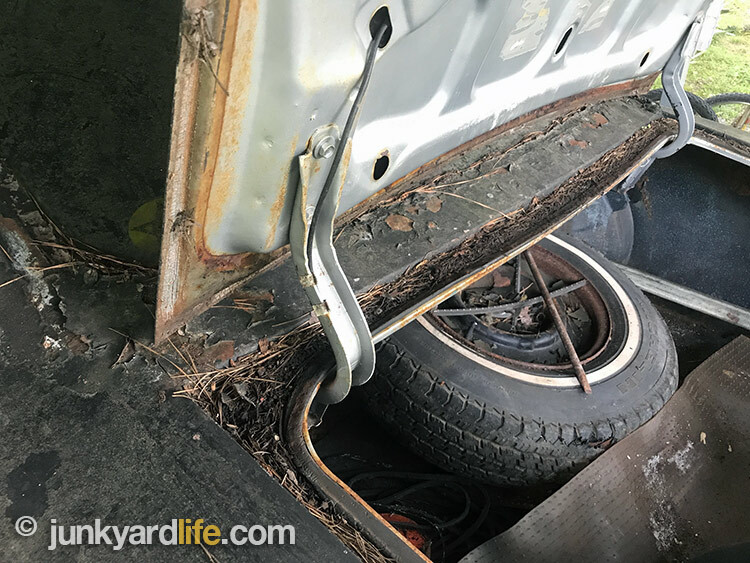 If you have an old car in your yard, chances are we've met. I keep my hands greasy working on whatever vehicle I can drag home. I sell my junk to pay for more car parts and food for the family. See you at the junkyard. A gearhead whose imagination revs to redline when hunting old cars and parts. He feeds his passion for dilapidated Detroit iron by writing, photographing and sharing his adventures. Buckle up and hang on, because Ron, a.k.a "The Earth Roaming Car Guy" brings high-speed energy and enthusiasm that can be felt in his treasure hunting experiences. Enjoy. Copyright &copy 2017 and Jody Potter, junkyardlife.com. Powered by Blogger.